Brandi Chastain celebrates after scoring the winning goal of the 1999 World Cup. Title IX is often credited with getting more girls involved in sports, but there's another, more intimate milestone in the women-in-sports story that deserves some recognition: This year, the Jogbra turns 40. In 1977, Hinda Miller had just started working at the University of Vermont and had taken up jogging. But she found she had a problem: What to do with her breasts? "I used two bras," she says. "You know, everyone has their stories of what they did." Across campus, Lisa Lindahl was in the same predicament. 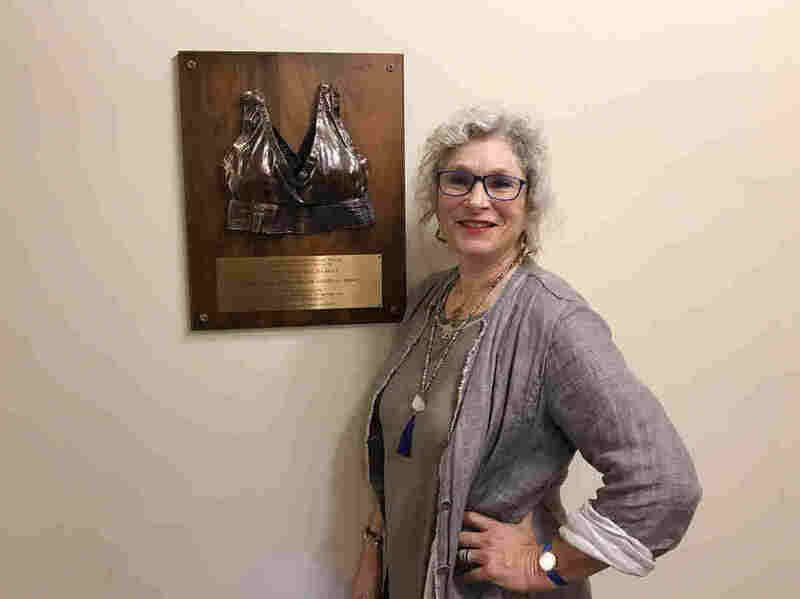 She reached out to a friend — Polly Smith, who made costumes for the university's theater department, where Miller also worked — and the three of them got together to build a better bra. "We bought some bras, tore them apart," Miller remembers. "I was taking notes; Lisa was running. 'Does that feel good? Does that feel good?' "
None of it felt good. See, breasts move — a lot. Up and down, side to side, even back to front. And they can be really heavy. Try as they might, the women couldn't figure out how to make a bra that could stop the painful bounce. At one point, Lindahl's then-husband came downstairs with two jockstraps slung over his chest. He was teasing them, but it led to an idea. Miller remembers thinking, "That's what we want to do — we want to pull everything close to the body." Hinda Miller stands by a bronze plaque at the University of Vermont that commemorates the Jogbra. She ran to the store, bought two jockstraps and brought them back to the costume shop. "The waist band became our rib band," Miller says. "We crossed the straps in the back because we didn't want them to fall, and it went over our head. And that was it." They thought about calling their creation the Jockbra, but decided Jogbra was a better fit. The design caught on, and Miller and Lindahl made Jogbra into a national brand. Two decades later, at the 1999 World Cup, the sports bra got its moment in the sun. U.S. women's national team star Brandi Chastain scored the winning penalty kick of the championship game. Then, filled with emotion, Chastain pulled off her shirt in celebration, revealing a simple black sports bra. Images of that moment were featured on the covers of Newsweek and Sports Illustrated, and on the front pages of countless newspapers. These days, women have all kinds of options when it comes to their sports bras: There are sports bras as outerwear and sports bras that are glittery, patterned or have crisscrossing straps that peek out prettily when you're doing yoga. They're big business: Global sales topped $7 billion in 2014. But the foundational truth remains: The best sports bra is the kind that allows girls and women to move the way they want to move, without worrying about their anatomy. Chastain says sports bras are more than clothing — they're an essential piece of equipment. "I couldn't play without my cleats, and I wouldn't and couldn't play without my sports bra." The sports bra may be the unsung hero in the rise of women in sports, quietly claiming its place under a T-shirt. And it all comes back to two jockstraps sewn together in 1977. Jane Lindholm (@JaneLindholm) hosts Vermont Public Radio's Vermont Edition.